Lighter than wood, this walking crutch by Drive Medical provides stability and durability. Each crutch is manufactured with a double extruded center tube to ensure additional strength on weight-bearing areas. Extra thick (latex-free) underarm pads and hand grips provide maximum comfort when in use. Tool free push-button adjustment allows the height of the underarm pad to be easily adjusted in 1" increments. Hand grips adjust separately without tools to ensure a proper fit. 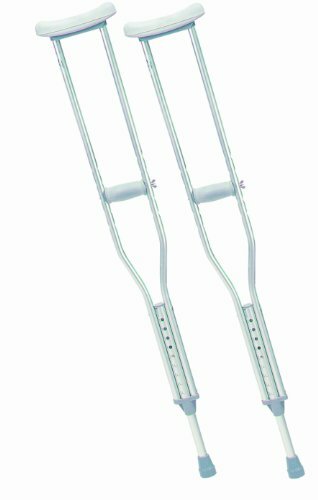 This crutch is available in four sizes: adult, tall adult, youth and pediatric. *Note for weight capacities:Youth and Pediatric models can withstand 175 lbs.Adult models can withstand 350lbs. *Note for sizing:User Height Ranges for model 10416-1: 4' to 4'6"User Height Ranges for model 10401-1: 4'6" to 5'2"User Height Ranges for model 10400-1: 5'2" to 5'10"User Height Ranges for model 10402-1: 5'10" to 6'6"